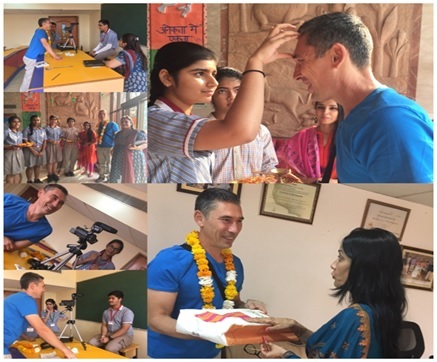 K.R.Mangalam World School, Vikaspuri hosted the French Delegate from Erp, Midi-Pyrenees, France, Mr. Bastien Paquier, from 24th, Oct. 2016 to 28th, Oct. 2016. Mrs. Meenu Kanwar, the school Principal welcomed the delegates with a short introduction of the school. A tour of the school followed, with staff members. Following the tour, students of Primary and Middle Wing interacted with the delegate with queries about the school system in France. The normal school day for elementary students begins at 8:30 and end at 4:30, with a two hour break for lunch and extra curricular activities. They also learned that French students are expected to learn at least two languages, and some learn three different languages. Students of classes IX& X interacted with Mr.Paquier to enlighten him about Indian culture, Indian education system, traditions etc. More interactive sessions and knowledge sharing sessions are planned for the coming days.